As I have previously mentioned, I host a weekly film series. It’s a great experience for me because these movies that I never got to see in theaters (like The Jazz Singer and Citizen Kane) I get to experience from a whole new perspective. Marty is romantic, funny, sweet and touching. 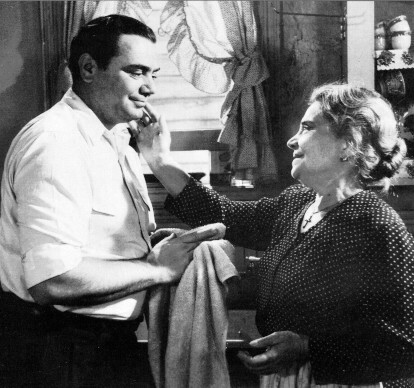 The film stars Ernest Borgenine as Marty Piltetti, a lonely butcher who lives with his overbearing Italian mother. As he approaches middle age, Marty is constantly getting pressure from his family, friends, and even neighbors with the deadly question, “Hey Marty. When are you gonna get married?”. Unfortunately for Marty, he has his insecurities: he talks too much and he respects women too much to mistreat them. He just wants to fall in love and sweep a girl off her feet. One night he meets Clara (Betsy Blair), a not soattractive school teacher, who has been just as unlucky in love as he has, and Marty’s world is turned upside down. Instead of being pressured into marrying, his family and friends try talking him out of it. This is the only movie to ever win the Best Picture Academy Award and the Palme d’or at Cannes. It’s one of those special movies and a definite must-see. You will fall in love with Marty and you will be rooting for him to find the girl of his dreams. Thanks for that. This is one of the few older films that I’ve never seen anywhere. I have to check it out. I’ve always enjoyed Ernest Borgnine, even though I wish he got more real acting roles. Borgnine is one of the more underappreciated actors of his day. “Marty” is by far his greatest role; it’s the only one he received won an Oscar for (and the only timeher was nominated). Now he does a lot of voice over work, made for TV movies, and cameos. I still love him.